Read the News...in Ancient Greek! Polyamory - the Next Sexual Revolution? Below is an excerpt from the book The Holy Snakes of the Virgin Mary: Examining the Mysterious Annual Appearance of Snakes in Kefallonia by John Sanidopoulos. Knowledge of the mysterious snakes of Kefallonia came to me when I was 15 years old while on a pilgrimage to Greece in the summer of 1991. There were many fascinating and mysterious sacred shrines of Orthodoxy throughout Greece I had heard of up to that time which perplexed me and seemed strange to my American bred mentality. In America we are taught to be fascinated and mystified by the paranormal, UFO’s, haunted sites, strange phenomena like the Bermuda Triangle, and strange creatures such as Bigfoot and Mothman; the majority of which, though interesting, seem more shady or demonic in nature than godly. On the other hand, in Greece it seemed every city, town and village had tangible shrines and historical tales of God’s presence among his people and revealed the centuries old piety and faith of Orthodox Christians which any pilgrim could visit, venerate and reflect upon.1 It was on such a pilgrimage that I embarked upon that summer. One of the most famous shrines in all of Greece is the Monastery of Saint Gerasimos in Kefallonia. This holy shrine contains the greatest of Kefallonia’s mysteries – the incorrupt relics of Saint Gerasimos. Saint Gerasimos founded this monastery, now a convent, in the sixteenth century, and lived such a holy life that his body did not decay after death and exuded a beautiful fragrance as a foretaste of the resurrection and a testimony to his acquisition of the Holy Spirit. Since then, this shrine has been the site of numerous healings, especially for those possessed by demons. This is where I came on August 5th with my mother and two grandmothers and stayed for two nights in their pilgrim’s quarters. The next morning I attended Matins and Divine Liturgy for the Feast of the Transfiguration of Christ. Interestingly, at the point in the service when the Saint’s tomb was opened for viewing, a lady next to me fell paralyzed on the floor. This woman had earlier yelled at me for whispering something to my grandmother during the service. It was speculated among the worshippers that she seemed to be demon possessed and I should leave her be. After receiving Holy Communion and venerating the exposed relics, we departed for Argostoli via bus to get some breakfast and catch a taxi to Markopoulo. We arrived around noon and found out the Paraklisi3 Service and the appearance of the snakes would not begin until 8:30PM. Knowing how eager I was to stay and experience the phenomenon, my mother and grandmothers waited with me eight hours in the hot August sun underneath an olive tree. Consequently, this gave us the opportunity to converse with the locals concerning the snakes of the Virgin Mary, among whom was a local villager for eighty-plus years. It also gave me the opportunity to reflect in the chapel and walk around the area. The locals explained, besides the common history and traditions, how in the olden days some twenty to thirty snakes would appear yearly. However, years ago a fire consumed the village all the way down the mountain to the sea during which bombs were dropped to prevent it from spreading throughout the heavily forested island.4 They speculated that because of this many snakes must have died, since that year only seven snakes appeared, followed by three the following year, and finally only one appeared in 1990. We were also informed of a local who ran over a snake and killed it while riding his carriage with his horse. This was before the fire however, and he brought it to the church for burial.5 Because only one snake appeared the previous year, I began to worry whether any would appear this year. Though I was not a witness of this mysterious phenomenon, I was able to acquire enough knowledge and see enough pictures to satisfy most of my curiosity. Recently I researched this phenomenon of the holy snakes on the internet and came across a lot of distorted and contradictory information,8 together with articles by skeptics attempting to refute this from being called a miracle. For this reason, I decided to write an accurate account of this mystery together with an explanation to the skeptics who do not quite understand why this phenomenon is considered a unique miracle by thousands who have witnessed it. The island is famous for its peculiar geological phenomena, which are unique in the world. Outside the beautiful capital Argostoli is the phenomenon of the Katavothres, in which sea water pours through cracks in the rocks near the shoreline and disappear into the endless subterranean tunnels. In 1963 Austrian geologists discovered these waters reappeared after two weeks on the other side of the island at Lake Melissani, a semi-underground lake of indigo colorations. Nearby is the Drogarati Cave, a stalactitic and stalagmitic cavern 144 feet below ground. Lake Avythos (Gr: bottomless) is so deep that local tradition makes it bottomless.11 Kounopetra (Gr: the moving rock), southwest of Lixouri in Paliki, is a huge monolithic rock that sticks out slightly into the sea which made a small, rhythmic, non-stop motion until the 1953 earthquakes stabilized it and stopped its movement. Dominating the island is the imposing Mt. Ainos. 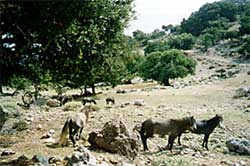 On this mountain, surrounding the Monastery of Zoodochos Pege (Gr: Life-Giving Spring), lives a rare species of wild horses (or ponies) unseen anywhere in the world.12 It is from this mountain also that official government records from the seventeenth century describe a strange story of a man and sheep eating dragon that was slayed by two local brothers in 1509. Furthermore, the unique Kefallonian Fir Tree of Ainos is endemic of Greece and efforts to plant it elsewhere have failed. Agia Dynati is home to animals such as hares and goats with gold and silver plated teeth. Research has shown this is due to the mineral substance “mica” in the soil of that particular mountain. It is also reported that certain goats on the island do not drink water for six months at a time. In the villages of Demoutsanata and Pastra, there is another unusual wonder in the village churches. On the Feast of the Ascension of Christ, which usually falls in May or early June, women on the island pick lilies and place them in the village church. Whereas any botanist would argue that once a flower is cut and its stem dry it cannot bud again, these flowers do. On August 22nd, at the Vespers of the leavetaking of the Feast of the Dormition, the lilies are placed in front of the icon of the Holy Virgin. When morning comes, these same lilies fully blossom again. One can see on the icon a fully blossomed lily with a dry stem. The locals consider this a wonder of the Virgin Mary. It was on this island that Saint Kosmas Aitolos (1714-1779), whose crosses are enshrined on the island,13 made some of his famous prophecies, including his foretelling of the telephone.14 Kefallonia has produced many beloved Saints of the Orthodox Church, most famous of whom is Saint Gerasimos, whose body has shown very little decay and heals many sick and demon possessed by God’s grace. There are numerous other peculiar stories associated with the Saint, including a deep well he dug which overflows and a five-branch plane tree he planted which bows during his festive procession on August 16th, as well as the numerous sightings of the Saint by the locals prior to the devastating earthquake of 1953. 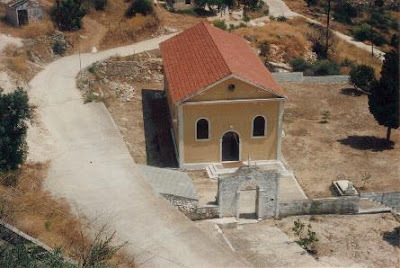 Kefallonia is also the home of four other more modern sacred shrines of Orthodoxy. The first is that of the native Saint Anthimos Kourouklis (1727-1781), who founded six monasteries in Kefallonia and is entombed in the place of his asceticism in Lepeda. 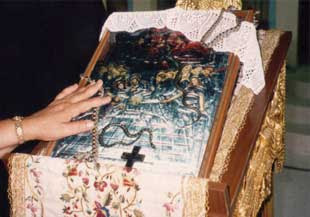 There is also the original casket of the sainted Patriarch Gregory V (+1821) constructed by native Kefallonian Nikolaos Sklavos, when he recovered his corpse from the waters of the Bosporus after being hanged by the Turks in Constantinople.15 This relic is kept at The Holy Theotokos Church of Ntomata. Another prophet and miracle-worker native to Kefallonia is Saint Panagis Basias (1801-1888), whose tomb and sacred remains are kept in a silver larnax at Saint Spyridon’s Church in Lixouri. One can also visit the famous pilgrimage site that lies in ancient Sami at Saint Fanentes Monastery which houses a wonderworking icon of the Holy Martyrs Gregory, Theodore and Leon. Unfortunately there are no known historical records in existence regarding the convent that existed on the site of the present church prior to its destruction in 1705. Nothing of the convent remains, except the bell tower from which the snakes emerge, and pious villagers who were mainly illiterate lived more by a strong oral tradition than the written word. Fortunately the tradition has been handed down regarding the purpose of the convents’ location and its eventual destruction. It is said that years before the destruction of the convent, the villagers of Markopoulo noticed a tree on fire further up the hill. To prevent the fire from spreading into the forests and eventually into the village, the villagers hurried to put out the flames. When they arrived, the tree had burned to the ground, but at its root lay an icon of the Virgin Mary unharmed and unconsumed. The find perplexed the villagers and they considered this a divine sign. With great joy and amazement, they took up the icon, venerated it, and placed it in the main church of the village square. The next morning the icon was missing, only to be found later at the same spot the tree had burned. Thinking this was done by human rather than divine hands, the villagers this time placed the icon back in the church and locked it. After the same reoccurrence three times, the villagers eventually realized the Holy Virgin wished the icon be housed at the location of the burnt tree. At first an icon stand housed the icon until a church was eventually built. A little later, this developed into a convent. America’s first war with Islamic terrorism began in the beginning of the nineteenth century under President Thomas Jefferson. At this time the Barbary Pirates of North Africa terrorized Europe, capturing Christians and enslaving them.18 They were so feared that European nations and America were paying them a tribute to ensure safe passage in the Atlantic and Mediterranean.19 In fact, the United States Navy was created to fight the Barbary Pirates, and subdued them in 1815. A century earlier, in 1705, it is believed these same Barbary Pirates invaded Kefallonia for looting. Kefallonia was no stranger to the wrath of pirates. During this time Kefallonia was under Venetian rule, and since 1537 when Sultan Suleiman the Magnificent declared war on Venice, the famed pirate and admiral of the Ottoman fleet Barbarossa20 and his later chieftains attacked Kefallonia continuously. It took more than two centuries before Kefallonia was at rest from these pirate invasions. The significance of 1705 rests in the fact that it was in this year the convent of Markopoulo was invaded. Monasteries and convents were often looted because of the treasures they contained and the food they stored, which is why many monasteries have walls surrounding them. Markopoulo rests three hundred meters above sea level, easily visible from the sea, and it was to this location the Muslim pirates climbed. In fact, according to tradition, the first pirate invasion of the convent in Markopoulo took place in the 1400’s. It is said during this invasion the pirates raped, looted and pillaged. Another horrible pirate attack took place in 1690. For this reason, when the pirates came the third time, the nuns knew the horrors they faced and earnestly sought the protection of the Holy Virgin. At this point the story gets a little sketchy. According to one theory, when the pirates docked at Katelios and reached the monastery, the nuns ran to the bell tower as the convent burned in fear of being raped and captured for slavery. There they prayed to be transformed into snakes so as to escape unharmed. God answered their prayer and they slithered away to safety. Others say the nuns merely prayed for protection while the convent was burning, and suddenly snakes appeared everywhere around the convent, frightening the pirates away. What can be said for sure is that according to the tradition, snakes played a significant role in somehow saving the nuns, and since then they have appeared every year during the feast of the Dormition. Though some relate the story of the discovery of the wonderworking icon of the Holy Virgin that is written above concerning the burning tree, there is also another story. 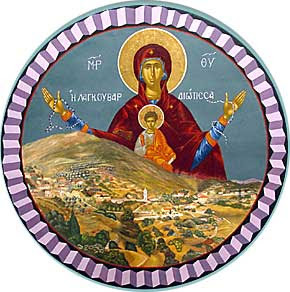 Some say when the convent burned in 1705 everything was destroyed except the wonderworking icon of the Holy Virgin. 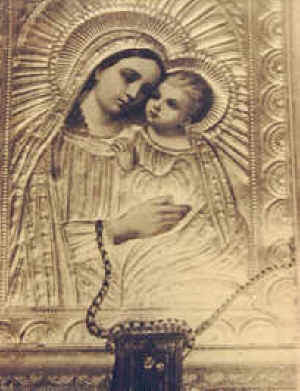 Eventually a church replaced the convent to house the miraculous icon which was preserved unharmed. Of course, the two stories need not be contradictory, but could be complimentary. It could be that just as the icon was miraculously discovered, so also it was miraculously preserved. Because this miracle was so localized to the small village of Markopoulo and the surrounding island, we only have stories of the contemporary villagers from about thirty years ago to the present to rely on its history, together with the few archives of the Metropolis of Kefallonia and government records. The first significant moment took place in 1924. Whereas previously all Orthodox Christians followed the Julian Calendar, a synod was held in Constantinople to update the calendar to the more accurate Revised Julian Calendar. This caused tremendous confusion and protests amongst the pious faithful throughout Greece, many of whom considered this a disguised ecumenical innovation rather than a mere scientific progression. The residents of Kefallonia were not exempt from this confusion. Because they could not make up their minds, they decided to leave the issue to the guidance of the All-Holy Virgin through her tiny Snakes. Since the snakes come out yearly during the specific days of August 6th to the 15th then disappear, they wanted to see if the snakes this particular year would come out during the normal Old Calendar reckoning or according to the New Calendar, a thirteen day difference. To everyone’s amazement the snakes appeared according to the New Calendar reckoning, confirming in their conscience the will of God. For this reason the entire island follows the New Calendar. It is believed among the locals the appearance of the snakes bear a prophetic significance. Their appearance is a sign the land will fair well, that it will be a good year and peaceful. For this reason, from the evening of the 5th of August it used to be that the children would light candles in search of the snakes around the bell tower to ensure their appearance and hope for a special blessing for the upcoming year. When found, they would yell “βγηκανε τα φιδια!" (“the snakes have come out”!) with great joy. Whereas the appearance of the snakes signifies blessing and good fortune, their failure to appear is a sign that some sort of distress will befall the inhabitants of the island. This actually happened twice, in 1940 and 1953. Anyone familiar with English author Louis De Bernieres’ international best seller Captain Corelli’s Mandolin24 published in 1994, or the film adaptation released in 2001, knows the great distress the inhabitants of the island suffered within this turbulent period. In August of 1940 the islanders gathered in the Dormition Church and expected the usual appearance of the holy snakes. The final celebration of August 15th came and went with no appearance. As expected this not only brought sadness and confusion, but speculation as to what was happening since this never happened before. Though it is possible the snakes did not appear in Kefallonia for this tragic reason, what the locals know for sure is that within a year their island was to undergo tremendous suffering as well. On April 6, 1941, Hitler attacked Greece for the first time and united his forces with those of the Italians. The island of Kefallonia began its occupation by Axis powers on April 30, 1941. Until late 1943 the occupying force was predominantly Italian -- the Acqui division plus Navy personnel totalled 12,000 men -- but about 2,000 troops from Nazi Germany also were present. The German occupation in Kefallonia began on September 24, 1943. Nazi brutality reached a climax in the mass slaughter of officers of the Acqui Division, who had surrendered to the Allies. The prisoners of war, approximately 6000 of them, were led to the "Red Villa" and from there to a cave higher up, where they were executed. The Nazi occupation lasted only a year, but it was a bitter ordeal for the indomitable people of Kefallonia. The majority of the islanders joined the organized national resistance movement. Lootings, arrests and executions were daily occurrences. The German occupation forces finally left the island on September 10, 1944. While the Second World War ended in 1945, Kefallonia remained in conflict due to the Greek Civil War. Peace did not return to Greece and the island until 1949. Though it is commonly held the snakes did not make their appearance in 1940, others insist that it was throughout these turbulent years, or at least in certain years of the occupation, that the snakes did not appear as well. Even De Bernieres writes: “In the year of the German occupation , the Holy Snakes did not appear at the Church of our Lady at Markopoulo, and neither did the Sacred Lily flower at Demoutsandata.”27 It should also be noted the original church of Langouvarda was burned in the fire of 1945 and completely destroyed in the earthquakes of 1953. Earth tremors are a part of everyday life in Kefallonia, as they are throughout all of Greece. Between August 9 and 14, 1953 a series of devastating earthquakes hit Kefallonia, which is so vividly described in Louis De Bernieres' novel. Tremors reaching 7.2 on the Richter scale shook the Ionian islands of Zakynthos, Kefallonia, Ithaca and Lefkada, with almost every house and building destroyed in Kefallonia, leaving only Fiscardo on Mt. Ainos to the north untouched. Damage was estimated in tens of millions of dollars. However, the real damage to the economy occurred when residents left the island.28 Since the quakes occurred during the fast of the Dormition, the snakes failed to appear, whether by instinct or not is unknown, but the residents knew something was wrong when they failed to appear before the 9th. Since the Langouvarda Church was destroyed in 1953, it was soon rebuilt and the snakes appeared every year since at the present church dedicated to the Dormition of the Theotokos. The number of snakes vary, but apparently they are smaller in number now than before the war. It is said when the snakes are fewer in certain years than others, then something unpleasant is occuring or will occur on the island, such as in 1981 when the Metropolitan was in a dispute with many in his flock and only two snakes appeared. 1 It is reminiscent of the sacred nature of Biblical holy sites, such as those mentioned in the historical books of the Old Testament visited by the Patriarchs and Prophets, and in the New Testament which were memorialized by Jesus and his Apostles. 2 Monk Isaac. Eµφανισεις και Θαυματα της Παναγιας. Sacred Monastery of Paraklitou. Attica, Greece, 1991. Other good resources in Greek are: Gouveli, Archimandrite Daniel. Το Θαυμα της Πιστεως. Athens, 1985; Nikolaou, Metropolitan Fthiotidos. Оι Εμφανισεις της Παναγιας: Μυθος η Πραγμακοτης; Apostoliki Diakonia. Athens, 1997. 3 During the fast of the Dormition of the Theotokos, two services are celebrated on alternate days from August 1st-14th – the Great Paraklisis and the Small Paraklisis. These services are supplications to the Virgin Mary for the health of body and soul through her intercessions. 4 This was probably the great fire of 1945, though many fires have devastated the area since then. 5 This was lost in the fire. 6 It is from these doors the snakes enter. 7 I am not sure of the exact number of snakes, but they are multiple according to pictures and reports. 8 This information is especially spread by people who have not witnessed the miracle nor are they really interested in presenting the facts (for example, the travel guides to Kefallonia). 9 Among his influential works are: The Mysteries of Kefallonia; Behold the Man; Poems and Anecdotes; Customs and Beliefs in Kefallonia; My Persecutions Come To Light; A Reply To Excommunication; and Autobiography. Laskaratos promoted a primitive form of Christianity uninfluenced by the Church and its traditions. He died in 1902 at Argostoli. 10 It is said among the locals that when he was excommunicated, somebody visited him to inform him of the news. Laskaratos replied: “I’m grateful to the bishop for excommunicating me, but I’d like to ask him to excommunicate my children’s shoes as well, so they will never wear out.” He said this because it is a common folk belief that whoever is excommunicated justly, their body will not decay after death. Only one priest was allowed to serve at his funeral. 11 The lake Avythos (bottomless) or Akoli is located near St. Nicholas Village in the area of Pyrgi. The lake was thus named because its bottom has not yet been detected, a fact that creates a lot of mystery around it. However, there is another theory claiming that the lake is intervened by a subterranean river whose force throws aside all measuring instruments. 12 They are descendants of the horses of the Pindos Mountains in northeastern Greece. The many decades of life in isolation, the hard living conditions and their resistance and adjustment to hardship brought their differentiation to the point of being a separate pure breed. Their medium height classifies them between the breeds of Pindos and Skyros. The horses of Ainos are direct descendants of the Greek horses of Alexander the Great and they are one of the few species in Greece and in the world existing today in a free state. 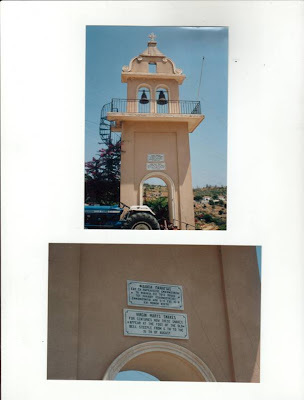 13 One cross is located at the Church of Evangelistria in Faraklata. Other crosses are kept at Agrilia Monastery and in Assos. Another preserved local prediction he made was the following: “The Red Hats will come and then the British for 54 years, after which it will become Greek.” Red Hats was a term then used for the French Army alluding to the color of the soldier’s berets in the era of Napoleon. In fact, after the Venetians, the island was occupied by the French who were followed by the British. The British occupied the island for 54 years, just as he had predicted! 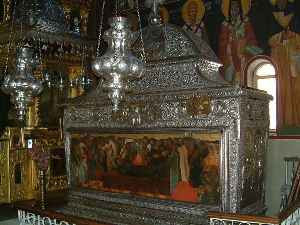 15 In 1871 the relics of Saint Gregory were brought to the Cathedral in Athens from Odessa. 16 On August 15, 2006 this event was featured on CNN, the BBC and in American newspapers. 17 The locals call the church by the name “Langouvarda.” It seems the name originates from the Langobardi or Longobardi, the Latin name for the Lombards. The association between the Lombards and the church in Markopoulo is significant, though it is unknown as to why the association exists. Some speculate it has something to do with the origin of the icon and/or the church. The Lombards were a Germanic people originally from Northern Europe that entered the Roman Empire in the 570’s. The name “Lombardy” applied to the whole of Northern Italy until the 15th century. During the seventh century Kefallonia belonged to the Eleventh Thema of the Eastern Roman Empire which included Italy and the seven Ionian islands, and was called “the Thema of Langovardia” until the eleventh century. The island’s administrators at the time were titled: “General of Kefallonia and Langovardia.” At the end of the eighth century the Lombards raided and captured Kefallonia for a short period. To bring the matter closer to the reason why the church is called Langouvarda, it is interesting to note the association between the village name of Markopoulo, and the legendary explorer Marco Polo. Though some have postulated the possibility that Marco Polo may have been born in Kefallonia, this seems very unlikely since Albanians occupied Markopoulo in 1450 and the name of the village could be associated with Markopoulo in Attica. However, Dante does refer to Marco Polo as a Lombard in his Purgatorio (C, XVI. 46), and therefore the village may have had a significant role with the Lombards. 18 According to the calculations of historian Robert Davis, between 1 million and 1.25 million European Christians were captured and forced to work in North Africa from the 16th to 18th centuries. Davis, Robert, C. CHRISTIAN SLAVES, MUSLIM MASTERS: White Slavery in the Mediterranean, the Barbary Coast and Italy, 1500-1800. New York. Pelgrave, 2003. 19 In 1784 the U.S. Congress was appropriating $60,000 annually as tribute to the Barbary states. This ended in 1801 when the wars along the North African coast began. Some European nations were paying annual tribute into the 1830’s. See also: London, Joshua E. Victory in Tripoli: How America's War with the Barbary Pirates Established the U.S. Navy and Shaped a Nation. New Jersey. John Wiley & Sons, Inc, 2005; Leiner, Frederick C. The End of Barbary Terror: America's 1815 War against the Pirates of North Africa. Oxford University Press, 2006; and Lambert, Frank. The Barbary Wars: American Independence in the Atlantic World. Hill & Wang, 2005. 20 The pirate brothers Barbarossa were Aruj Barbarossa who died in 1518, and Khayrad'din Barbarossa who died in 1546. Both were born on the island of Lesvos; their father was a Janissary (he was forced to convert as a child from Orthodox Christian to Muslim) soldier named Yaqub, who had been granted land on the island, and their mother Katerina was a widow of an Orthodox Christian priest. The Greek born Barbarossa (Italian: 'redbeard') brothers founded the power of the Barbary corsairs in the 1500's, attacking Christian shipping and coastal towns around the Mediterranean. It was Aruj the elder who had the red beard, which became their nickname, and not the younger Khizr, who became better known as Khayrad'din and carried a brown or an auburn beard. Corsair pirates were both Muslim and Christian and operated in the Mediterranean Sea between the 15th and 19th centuries. Muslim corsairs, such as the Barbarossa brothers, had bases along the Barbary Coast of northern Africa. They built several strong fortresses to defend the Barbary ports of Algiers, Tripoli and Tunis, and paid the sultan of Tunisia one fifth of their booty to use Tunis as pirate headquarters. Christian corsairs were based on the island of Malta. Muslim and Christian corsairs alike swooped down on their targets in swift oar-powered boats called galleys to carry off sailors and passengers. Unless these unfortunates were rich enough to pay a ransom, they were sold as slaves or put to work as oarsmen on the corsair galleys. Christian corsairs carried razor-sharp rapiers into battle and often wore metal helmets and breastplates. By the 16th century the corsairs had established a pirate empire, the Barbary States, in the countries of North Africa. The pirate governments were supported by selling Christians into slavery and by taking heavy tribute as protection money from other countries. By 1510, Aruj was one of the richest men in the Mediterranean and he with his brother Khizr were the masters of eight well-built galleots owning vast property and slaves. See: Baker, Thomas. Piracy and Diplomacy in Seventeenth-century North Africa. Fairleigh Dickinson University Press, 1989; Bamford, Paul W. The Barbary Pirates: Victims and the Scourge of Christendom. Associates of the James Ford Bell Library. University of Minnesota, 1972. Interestingly, on the island of Paros there is an annual Barbarossa Pirate festival on August 23rd. This re-enactment of a famous pirate raid on the island is vigorously performed by locals. For a day, fishing boats pretend to be pirate ships and young Parians act out the roles of pirates, defenders, and, of course, dancing damsels in distress. 21 According to the locals, this has happened a few times. 22 This is an unfortunately common experience. The church presently rests off a major highway, and cars have run over the snakes. 23 At one time a sailor took a snake on board his boat. The snake died and soon after the boat sank. 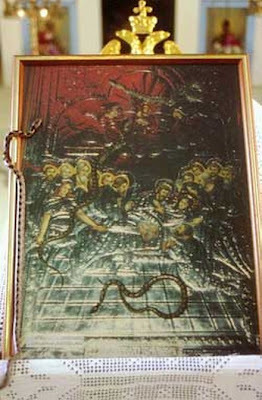 Remorseful, this man brought a golden image of the snake to the church. 24 The love story that is the theme of the book takes place during the events of the Second World War, and is based on historical facts; a highly recommended reading. 25 Tinos is the center of Greece’s most festive and notable yearly pilgrimage that takes place every August 15th. The Cathedral of the Annunciation houses a miraculous icon called Megalohari (Gr: She of Great Joy) or Panagia Evangelistria, which depicts the Archangel Gabriel proclaiming the good news of Christ’s conception to the Virgin Mary. In 1822 a nun named Pelagia from the nearby Monastery of Kechrovouniou had a series of visions of the Holy Virgin in which she was asked to recover an icon that had long been lost. Though initially very cautious of the divine origin of the vision, after a series of visions and reprimands she was finally persuaded to inform the bishop and initiate a search. The icon was finally discovered at the exact location revealed in January 1823, close to the ruins of a Roman church which had been apparently buried in an underground vault for nearly 850 years. This church was destroyed by Muslim pirates in the tenth century. While searching for the icon, the work crews decided to build a small chapel over the Roman ruins of the tenth-century church, which in turn had its foundation over a fourth-century edifice dedicated to the Mother of God and St. John the Baptist. The original church had been built in the first years of the Christian Roman Empire over the ruins of a pagan Greek temple dedicated to Dionysios. On this site a Cathedral was eventually built. Today the Cathedral of the Annunciation is probably the single most visited pilgrimage site in Greece, with over one million visitors a year. 26 Greece officially entered the war on October 28, 1940. This is celebrated annually as Ohi Day (No Day) commemorating dictator Ioannis Metaxas’ (1936-1941) refusal of the Italian ultimatum. The ultimatum demanded of Greece to allow Axis forces to enter Greek territory and occupy certain unspecified "strategic locations" or otherwise face war. Most scholars today say the actual reply was not “οχη” or “no”, but the French "Alors, c'est la guerre" ("Then it is war"). 27 Corelli’s Mandolin. Vintage Books. New York, 1994, ch. 62. 28 600 people died and the injured and homeless were in their thousands. As it was the middle of the day and people were cooking, fires also broke out and raged through the town. 70% of all constructions were demolished; towns and villages were rebuilt to new plans, with strict anti-seismic specifications, so that there is now little risk of a ceiling tumbling. The tragedy brought wide international response and support, especially from the United States, Britain, France, Sweden and Norway, who sent aid for the victims with generosity and speed. At that time also, many desperate Kefallonians left their island to seek a better life abroad.